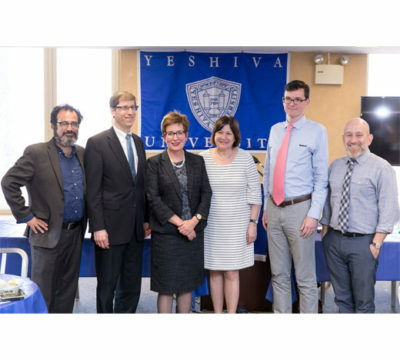 A two-day symposium, ‘Treasured Possession: Jews and Christians in a Medieval City,’ co-sponsored by the Yeshiva University Museum and the Metropolitan Museum of Art, will look at various aspects of medieval culture Nov 5-6. The special symposium is in conjunction with ‘Erfurt: Jewish Treasure from Medieval Ashkenaz’ on view until Jan. 29 at the YU Museum, the only North American venue for this exhibition of medieval gold and silver jewelry, tableware, and rare coins, culled from a personal treasure hoard. The more than 225 people at the sold-out program, “The Legacy of The Goldbergs,” came to the Center for Jewish History March 23 to visit their favorite, and oldest, Jewish mother—Molly Goldberg, the central character of the radio and TV show The Goldbergs, which ran from 1929 to 1956. “Fraud and Federalism: Overlapping Jurisdictions, Overlapping Crimes” is the name of a symposium being offered at Benjamin N. Cardozo School of Law on Monday, March 27, from 9:15 am to 4:30 pm. Four scholars will examine the Vietnam War’s lasting effect on American culture and history, US-Asia relations, and this year’s presidential election at a symposium, “The Vietnam War in Perspective,” at Yeshiva University on Thursday, April 22. The 8:15 pm program will take place on the university’s Wilf Campus, Furst Hall, Room 535, 500 West 185th Street, Manhattan.